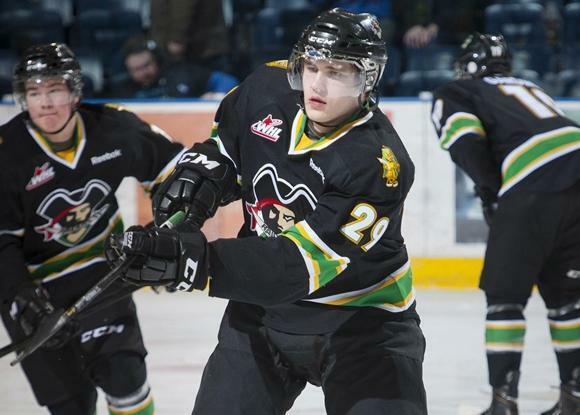 I continued our series of interviews with the top 2014 draft prospects and spoke with Prince Albert Raiders centre Leon Draisaitl. I like Draisait’s combination of size and skill. I really enjoyed speaking with him, because he had a very honest and mature viewpoint of where his game is, and where he hopes it can go. He told me he is currently 6’2″ and 208 pounds. He expects to be close to 215 by training camp. He was just named to Germany’s roster for the 2014 World Championships giving him another opportunity to impress the scouts before the June 27th draft. We spoke about adapting to hockey in North America, Germany’s development program and about his detractors. Gregor: Not a lot of guys could adapt to the North American game as quickly asyou did. How come you were so successful doing it? Draisaitl: In my opinion I have togive credit to the people around me like my billets. The guys on my team, theyjust made it so, so easy for me to adjust to the North American hockey and tothe lifestyle as well. They just made it real easy for me and I think that’sthe biggest thing. Gregor:Watching at the World Junior Championship and you were really aggressive. Youtook a lot of aggressive penalties and I found it funny that people are sayingyou’re not aggressive or driven. How would you describe your game? Draisaitl: You know, I don’t think I’m anaggressive player, but I know when to be physical and when I might have to pullback. I don’t think I’m an overly aggressive player, I mean I took somepenalties, I usually don’t take. Whoever knows me, they know I’m the last guyout there who wants anybody injured and then I accidently hit a guy from behindand had a high sticking penalty and then it didn’t really go my way at theWorld Juniors. I wouldn’t say that I’m a dirty or overly aggressive player, butI know how to be physical. Gregor:What is the biggest difference that you’ve noticed from going to the WesternHockey League to now playing with men? Is the strength that much of adifference even though six exhibition (lead up to world championships) games. Draisaitl: Yes, definitely. Exactly likeyou said, the strength, I think the way men skate and they’re just stronger.That’s just the way it is, it’s not that they’re working out more, I think it’sjust that they’re men and that’s why they’re stronger and it definitely takessome time to adjust. The guys in the WHL, they’re all strong kids, they’rereally good players but they’re just not men. There is some other smalldifference, but I also try to remember it takes some time to adjust. Gregor:Cory Clouston, your head coach in Prince Albert, has been a head coach in theNHL. What are some of the specific things he wanted you to work on with yourgame that he felt would help you as an NHL player? Draisaitl: You know, I think that Cory dida great job. I used to be, last year I used to be a more offensive player and nowhe made me be a complete player, a more complete player anyways. I know that Istill have a lot of work to do. I know that and I can tell you that I’m workingon it, but you know, he did a great job in teaching me how to play on bothsides of the game and to keep it easy. I think I learned when I can use mycreativity and when to make the easy play. Gregor:Coming out of Germany, Leon, compared to Canadian kids, you just don’thave the opportunity to play against the same level of competition and normallythat pushes kids to get better, yetyou’ve managed to come from Germanywhere I’m guessing most often you didn’t have the same level of competitionthat the Canadian kids did. To me I think your ceiling is maybe even higherbecause of that. Do you feel that you have a lot of room to grow as a player? Draisaitl: Yes, I totally agree. You know,it’s, I don’t like saying it, but it’s the way it is. Germany doesnot have the greatest development program and I think we’re getting better, butit’s still not where it needs to be in my opinion. So, I have a lot to learn. Iknow that, and I’m working on it and I’m willing to learn the game and be thebest player I can possibly be. Gregor:How did you become such a great creative offensive player? Where did thatcreativity come from, where did you learn it? Draisaitl: Ah, you know I think I did get alot from my dad. He was the same type of player. He likes to make playsoffensively and he likes to be really creative and I think that’s one thing Iget from my dad. On the other hand, I really work on that stuff in practice.Every single practice I’m trying to get better and even with the things thatI’m already pretty good at I’m still trying to get better at, because I knowthat there is a lot of room I can be better at and that’s what I’m trying toimprove every single day. Gregor:Some suggest that you’re not maybe a fireball, you’re not highly competitive.From games I’ve seen, I don’t agree with that. How do you respond to those whosuggest that maybe you’re not a highly competitive player? Draisaitl: I know I’m a really, reallycompetitive person. I want to win every single game. I know people say thatabout me but you know, I think it’s the style of game I play. In my opinion,that’s why people say that a lot. I like to control the game rather thanspeeding it up all of the time. And I know that I have to learn to speed it uptoo and that’s something that I’m working on right now, and I know that’s oneof my weaknesses. I think that’s what people say because I like to control thegame. I like to have the puck on my stick and then make things happen and youknow. But I know that I have to work on it for sure, it’s definitely one of myweaknesses. Gregor:How do you work on speeding up the game? Draisaitl: You know, this summer is a greatopportunity for me to get faster, to get quicker and then same thing with rightnow, I’m working on it. In drills, I’m going from trying to go full speed everytime and it’s going to work out one day but like I said, I think this summeryou really get your speed. Gregor:Who do you feel your game is similar to as far as the style, not saying thatyou’re going to guarantee to score 90 or even 100 points like those guys, butdo you see a similarity in how [Anze] Kopitar plays to how you play? Draisaitl: Yeah, do be honest I think I dohave some similarities to Kopitar. We are still different players and you can’tcopy any players, it’s just not possible. I always said I think one of theplayers who I can see some similarities to my game is Joe Thornton. He’s a bigguy who likes to protect the puck and he makes great passes. So I think thosetwo guys are the guys I can compare myself to the most. Gregor:As a guy who played against them, what was the best part of the Oil Kings game?What made them so good? Draisaitl: I think it’s just their depthand their D-men are outstanding, they’re doing such agreat job of shutting down top guys. And then I mean their forwards, they havesome really skilled guys like [Henrik] Samuelsson, [Curtis] Lazar, [Brett]Pollock, those are all top end players in this league and that’s why they’re inthe finals again. They’re not there because they are a bad team, they’re therebecause they’re probably one of the best teams, well obviously they’re one ofthe best two teams in the WHL. I can tell you it’s hard to play against them,but I think we challenge them. Most of the games were pretty close and at theend you have to give credit to Edmonton,they were the better team. Gregor:What do you do in your downtime, what are some of your hobbies, what do youlike to do outside of hockey? 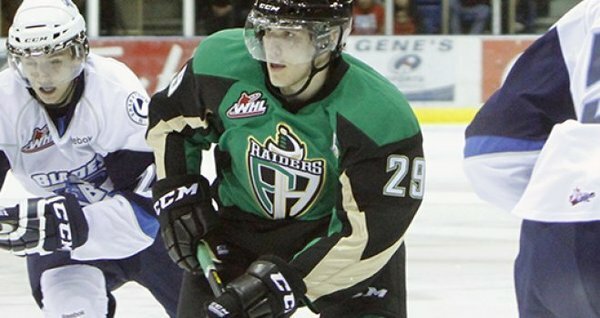 Draisaitl: Um, you know, I like to play adifferent sport. I like to play ping pong, I play soccer, volleyball, stufflike that and just hanging out with my friends from back home. I’m really a guywho likes to catch up with old friends and spend some time with the family.That’s what I’m doing. I don’t buy that Draisaitl is lazy or lacks motivation. In game two of the Oil Kings/Raiders series he was the best player on the ice. Like many young players he struggles with consistency, but I wouldn’t confuse that with a lack of passion. I feel Draisaitl has a lot of room to grow as a player. I won’t be surprised if he isn’t a truly dominant player until he is 22 of 23. That isn’t a bad thing, because very few players dominate right away, but if the team that drafts him is patient and fights the urge to rush him they will have a very good NHL player in a few seasons. Monday Mailbag – Can Leon Draisaitl drive his own line with the current wingers? I don’t think Ekblad is a lock to go to Florida. Colorado was in the same situation last year. Colorado needed a stud defenceman but they passed on Jones and took a forward. It worked out great for them and it wouldn’t surprise me at all if Florida did the same thing. Both buffalo and florida don’t lack defence but they are starving for some scoring. Ekblad would look awesome in Oilers silks but Draisaitl would to!